WELCOME TO ENCHANTED COVE where the forest meets the sea. 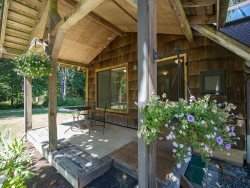 This delightful cottage has the benefit of large firs and cedars and a skillfully terraced yard that stair steps you right to the private & secluded sandy beach of Sequim Bay. Each terraced area has a deck or a gazebo where you can view the water & enjoy a complimentary bottle of wine. Two bedrooms, one with a queen bed the other with bunk beds (double and two twins) make the total occupancy of this home 6. One full bath with a tub/shower combination and a half bath. There is also a laundry room with washer and dryer. The kitchen is fully equipped including an espresso machine, and all sorts of gadgets available to whip up a tasty meal. The deck leads to the hot tub. What could be better than a nice soak in the tub while admiring the view? This home is adjacent to the Discovery Trail which will allow you to hike or bike off the highway, all the way to Port Angeles, so bring your bikes along. We really enjoyed our stay at this beautiful house! It was the perfect location for exploring Sequim and Port Angeles. We would definitely stay here again! The owner was delightful. Thanks so much, the place was perfect. My contact at Sequim Valley was Simone Nichols and she did an excellent job all through the rental process. Whenever I had a question, she was available with any information I needed. My family and I would definitely reach out to Simone for all our rental needs. I have to mention that I left some jewelry at the property and Simone reached out to the cleaning staff who had found it. I sincerely appreciate the efforts of Simone and her cleaning team in returning it to me. Simone was prepared to mail it to me if necessary. Our stay at Enchanted Cove was wonderful -- just too short! The home was lovely and the view at the property was amazing. Everything was perfect. Thank you. Actually, I only had contact through the website and via email. Everything was efficient, simply, and clear. We had two adults and 3 kids during our stay and we all had a wonderful time. It was delightful to enjoy morning coffee and watch the sun spread across Sequim Bay. The hot tub each evening was so relaxing and refreshing, as was the walks down to the little beach. The kids thoroughly enjoyed the bunkbeds and being together in one room. Plus, lots of board games made our evening family time loads of fun. We hope to stay here again. The queen bed mattress was hard. If you could improve on that, this will be a perfect HOT vacation rental providing a great experience for guests. Thank you for the wine and water. Very kind of you. It was enjoyed very much. The problems with the hot tub were addressed very well. Thank you. PS Adding dimmers to lights in the living, dining and kitchen rooms would be recommeded and apprecitated.